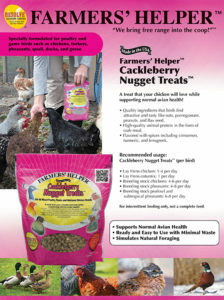 Farmers’ Helper™ Cackleberry Nugget Treats™ 27 oz. Oat Groats, Corn, Rendered Beef Tallow, Peanuts, Flax Seed, Dried Pomegranate, Crab Meal, Cinnamon (Flavor), Diatomaceous Earth (Flow Agent less than 2%), Sunflower Oil, Hydrated Sodium Calcium Aluminosilicate (Anti-Caking Agent less than 2%), Turmeric (Flavor), L-Lysine Monohydrochloride, Calcium Carbonate, Vitamin E Supplement, Niacin Supplement, Calcium Pantothenate, Vitamin A Supplement, Vitamin B12 Supplement, Riboflavin Supplement, Biotin, Vitamin D3 Supplement, Roughage Products, Mineral Oil, DL-Methionine Hydroxy Analogue Calcium, Fumaric Acid, Benzoic Acid (Preservative), Silicon Dioxide, Propionic Acid (Preservative), Acetic Acid, Ammonium Hydroxide, Sodium Hydroxide, Propylparaben (Preservative), Methylparaben (Preservative), Sorbic Acid (Preservative), Fenugreek (Flavor). 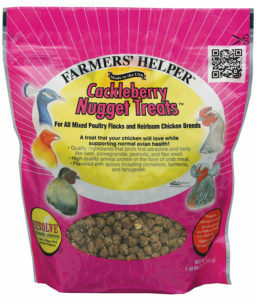 Quality ingredients that birds find attractive and tasty like oats, pomegranate, peanuts, and flax seed. High-quality animal protein in the form of crab meal. Flavored with spices including cinnamon, turmeric, and fenugreek.